The building was commissioned by emperor Vespasian, and its construction started in 72 AD. His heir, Titus, finished it in 80 AD, and Domitian carried out extra modifications until 96 AD. All these emperors belong to the Flavian dynasty, which is why the Colosseum is also known and the Flavian Amphitheatre. The current name Colosseum is derived from the nearby statue of Nero, which again, which again was probably deriving from the great Colossus of Rhodes statue, as historians speculate. Read more about Colossus of Rhodes and other lost wonders here. Emperor Domitian was responsible for building a large underground, called the hypogeum. It was used for storing animals and slaves, and it had two levels and entire tunnel networks connected to one another. He also expanded the top of Colosseum by adding a gallery and thus creating more seating space. As the largest amphitheater in the world, it was mainly built because it had to sustain large masses during the events games. The government policy at the time went somewhere along the lines of providing food and games for the people so that they wouldn’t raise rebellions. Thus, the term “Bread and Games” was born. The entrance was always free, and that is why there were so many open entrances – so that many people could enter at once, and do it quickly. The Colosseum was used for all kinds of public events, gladiator fights, animal beast hunts and animal fights, mythology drama shows, mock sea battles, and even public executions. It is believed that the first gladiator fights were held around 300BC, honoring the Campanians’ victory in war, which they led against the Samnites. There is evidence which shows that the first gladiator schools, called ludi, were indeed in Campania. The gladiator fights came to life during the Roman war with Carthage, 300 years before the Colosseum was built. Soon, aristocrat families competed against one another by hosting gladiator games, and being patrons of gladiator schools. Fights provided a way to earn a lot of money by simply wagering bets, and those who organized the best fights could even gain political influence and launch their career. Those who possessed immense wealth could personally own gladiators. While the original gladiators came from slaves and criminals, later on in the history free men often decided to enroll for the sake of eternal fame. Even one emperor, Commodus, couldn’t resist the urge to become a part of gladiator history and keep away from the arena. There are more than 20 types of gladiators, divided by the choice of weapons, opponents and fighting style – those on horseback, fighting with whips, lassoes, nets, curved swords, spears, and more. The West gate was more like a death gate – or to be precise, its name was the Gate of Death, since all deceased gladiators and animals were taken out through this exit. As opposed to the Gate of Death, there was also a Gate of Life, in the East. The victorious would parade in front of the emperor and if they survive the fight, they would exit through the Gate of Life, into the tunnel which led to the Ludus Magnus – a gladiator school. After the acceptance of Christianity, fights started slowly to die away. The last gladiator fight took place in Colosseum, in 404 AC. Naumachiae – mock sea battle, was held in Colosseum by Titus. The fight was staged by several thousand men. It isn’t known how they managed to create such a large body of water that could actually sustain the boats, regarding from a technical standpoint. Saved documents don’t provide the How, but they do testify about Naumachiae being held during the 100 days of inaugural games. It still raises questions how they managed to fill so much water and then after the show drain it and continue with other shows like gladiator fights. 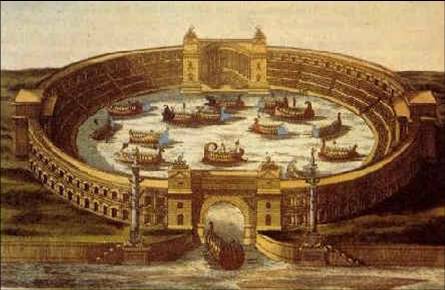 Some think that before the walls were built underneath, there was a wooden floor across the arena, and then it was lifted just before the naval battles, and filled with water. The common masses loved staged sea fights because there weren’t many opportunities where they could see ones in person. At first, the hunts (venationes) were organized separate from the gladiator fights, but later throughout history, those two events became inseparable. The hunts would usually start in the morning, and were later upstaged by the combats in the afternoon. These hunts were famous for numerous reasons – first, people could see exotic animals they have never laid eyes on before, and then there were barbecues of epic proportions after the shows would end. There were shows where beasts were pitted against each other, and where they would fight with men. Then there were shows which hosted animals that performed tricks, much like circuses of today. Also, venationes had a religious connotation since they were honoring goddess of hunt, Diana. After gladiator fights were banned, there was something that had to entertain the masses. So, animal shows continued to rage on for another 100 years after the last gladiator fight. The animal slaughtering often reached epic proportions. During the opening of the Colosseum, there were more than 9000 wild animals killed for such occasion. 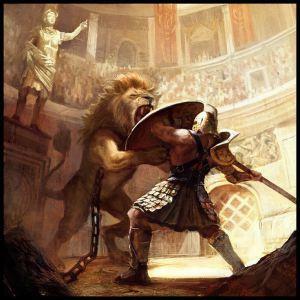 During its entire existence, there were million animals slaughtered in the Colosseum’s arena, and such hunts threatened entire ecosystems and diminished wildlife in the entire North Africa. During its existence, and especially during the gladiator fights, many have bloodied the arena and its sand, and would exit the world through the infamous West gate. As we have said before, more than 9000 wild beasts were killed only during the Colosseum’s opening, in the inaugural games that were organized by Titus. Later on, emperor Trajan held games in honor of victories in Dacia, which lasted 123 days. During that time, more than 11,000 animals were slaughtered, and more than 10,000 gladiators. During all the times while such games were held at the Colosseum, it has been estimated that more than 500,000 people lost their lives at that very arena. In 217, a lightning struck and great fire ensued, blazing across the entire city. All available personnel was mobilized, but hundreds of houses burned around the Colloseum, and all wooden construction and floors inside were burned to the ground. However, in 262, there was an earthquake of epic proportions, after which ensued a year of plague. In 429, Colosseum was hit by another earthquake, after which it needed a lot of maintenance. In 443, there was.. Guess what? More earthquakes. This one chipped at large parts of Colosseum. 1349 … And yet another one. 76 archers provided easy access to the seats. More than 100.000 cubic meters of Tivoli’s limestone – Travertine. The cobblestones you are walking on even today are the same cobblestones from the beginning of Rome, numbering more than 2600 years of age. There were 300 tons of iron embedded as clamps that held Travertine blocks together. Yearly, Colosseum amasses around 30 million euros. Here are some fun facts you probably didn’t know about Colosseum. For example, did you know that the movie Gladiator was supposed to be filmed in Colosseum of course, but in the end, Ridley Scott built one in Malta instead for 1 million dollars. He attained all licenses but there were simply too many limitations and restrictions, and that the real Colosseum wasn’t big enough for Hollywood. In the movie the Return of the Dragon, Bruce Lee fights against young Chuck Norris, his archnemesis, in the Colosseum. Today, Colosseum wows and amazes millions of tourists each year. It can boast with being a stage to many classical icons of the music industry, like Paul McCartney, Ray Charles, Elton John, Billy Joel, and more. Sources: Ancient Origins, Il Colosseo, the Colosseum, Wikipedia, a View on Cities.